This is a great takeout meal that you can make at home. We all know that takeout food is amazing, but also full of tons of sodium, additives, and, often times, MSG. It may take a little more time than calling for delivery, but the taste just can't compare. This is one of Jason's absolute favorites and he isn't even that big of a fan of Asian food! Next time you reach for the phone for takeout, try making this dish instead. 1. In a small saucepan over medium heat, add the sugar, ketchup, liquid aminos, vinegar, garlic powder, and pepper flakes. Whisk occasionally until heated through and sugar is completely dissolved. Set aside. Preheat oven to 375 and coat a 9x13 baking dish with cooking spray. Coat the bottom of the baking dish with 1/4 cup of the sauce. 2. Heat the olive oil in a large skillet over medium high heat. Set up a 3 stage dredging station: in a large, shallow dish, combine the two eggs with 2 tbsp prepared sauce, next combine the cornstarch with salt and pepper in another dish, and, lastly, the flour. Coat the chicken pieces by dipping in egg, cornstarch, then flour. Once dredged, place the chicken in the hot oil and shallow fry until just brown on both sides. Work in batches so the pan does not get over crowded. 4. Once chicken has browned on all sides, add it to the baking dish with the peppers and pineapple. Pour on the remaining sauce and toss to coat. Bake for 35-40 minutes, turning the mixture once or twice while baking. 5. Remove from oven, and serve over rice if desired. Enjoy! These are amazing! An awesome way to use fresh veggies from your garden. We have had a surplus of zucchini this year and this was a delicious way to use it up. My mom had given us lots of fresh garlic (is there anything better!?) and eggplant, we had the zucchini, tomatoes, and basil. This dish was fresh, light, and absolutely delicious! This would make an excellent appetizer, side dish, or a light dinner for two. 1. Slice the zucchini and eggplant into 1/4-1/2 inch slices on an angle. Place on a cooling rack over a cookie sheet and lightly sprinkle with kosher salt. Let sit for 30-60 minutes, wipe off excess moisture, flip and repeat. 2. Heat the balsamic vinegar in a small saucepan over medium heat until reduced by half, about 10-15 minutes. Set aside and let cool. 3. Heat a grill to medium heat and place a cast iron pan (or other grill friendly pan) on the grates. Toss the tomatoes with olive oil and place in heated pan. Grill the tomatoes until they begin to crack and burst, tossing occasionally, about 10 minutes. 4. While the tomatoes are cooking, toss the zucchini and eggplant with two tablespoons of olive oil and sprinkle with pepper. Mince the garlic and chiffonade the basil. 5. Once the tomatoes have begun to soften and burst, transfer to indirect heat and add the garlic and basil. Place the zucchini and eggplant slices directly on the grill and cook until lightly brown, approximately 2-4 minutes per side. 6. Assemble the napoleons: layer zucchini, eggplant, mozzarella, then tomatoes. Repeat one more time ending with tomatoes. Drizzle with the balsamic reduction and garnish with fresh basil. Enjoy! This is a great hot summer day meal. A fresh, cold soup is just what you need when the sun is beating down. All of the veggies can easily be chopped in a food processor if you want to bring the soup together faster. This is a great make ahead meal and will stay fresh in the fridge for a few days. 1. Combine all ingredients other than garnish(es) into a large bowl. Mix well, cover, and refrigerate until chilled completely. Serve and garnish as desired. Enjoy! Vanilla Extract is a staple in everyone's house. Right!?!? It's used in so many things - cookies, muffins, cakes, pancakes, ice cream, waffles, the list goes on. One of the best things about vanilla extract? It is so easy to make! All it takes is two ingredient.....and time. As the great Tom Petty once said, "the waiting is the hardest part..." and that's the truth with homemade vanilla extract. Once it's made, it just gets better as it sits. At a minimum you'll need it to sit for 30 days. But, 4-6 months is more ideal. The great part about it? It's good indefinitely. I'm still working through a batch I made almost a year ago. It makes a great holiday gift too - I filled up small bottles like these and added it to teacher gift baskets for Christmas. Redmond and Ashlyn's teachers loved it!! As for the beans, I prefer to use Madagascar Vanilla Beans such as these or these. I would imagine these Bourbon Vanilla Beans would work great too. The other ingredient is liquor. I've only ever used vodka, but I've read that rum or brandy work well too. I'm a fan of vodka so I've just stuck with that ;) When choosing a liquor you don't have to get too extravagant, but don't be too cheap either. 1. Cut vanilla beans into 1 inch pieces and place in a jar. 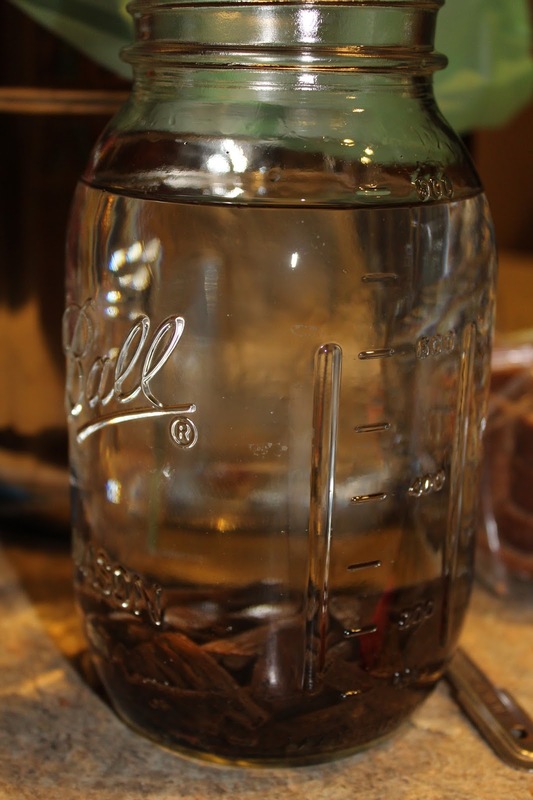 Pour alcohol over the vanilla beans, close the jar and transfer to a cool, dark place. Allow to sit for at least 1 month, but 4-6 is optimal. Shake jar every so often. 2. Store in your pantry or cabinet and use as needed.